Gemstones that change color under different lighting, such as alexandrite, are very rare, and most are quite valuable as well. 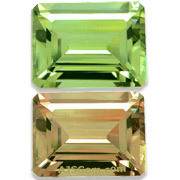 So it was newsworthy in 2006 when a new color change gem came on the market called Zultanite. Even more intriguing, this new gem came from an unlikely source: Turkey. Gemologically, diaspore is an aluminum oxide hydroxide by chemical composition and its crystals have an orthorhombic structure. Diaspore is reasonably hard at 6.5 to 7 on the Mohs scale, and it has a density of 3.30 to 3.39, similar to jadeite or peridot. Diaspore also has a relatively high refractive index at 1.702-1.750, ranking between tanzanite and spinel. When Murat Akgun, a Turkish jeweler, acquired the rights to mine disaspore in Turkey, he introduced the Zultanite brand to evoke the Sultans of the Ottoman empire. More recently, Akgun lost the rights to the Zultanite name after a falling out with his business partner, and he is now marketing the material under the name of Csarite. 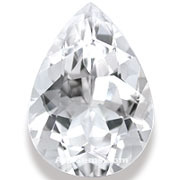 To avoid the confusion of so many marketing names, we refer to this material by its gemological name, Diaspore. Turkish Diaspore would also be an appropriate name, since quantities of gem-quality material seem to be unique to that location. 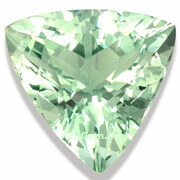 A very fine Color Change Diaspore in a large size with a strong color change. Beautifully fashioned in a precision emerald cut, this rare gem has excellent clarity (graded "loupe clean"). This fine stone will set up beautifully in your jewelry design. Guaranteed natural and untreated. A very fine Mexican fire opal in a vivid orange-red! 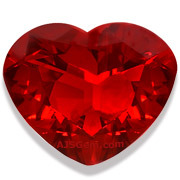 Precision cut with very good clarity, this lovely heart shape will make a gorgeous pendant. Guaranteed natural and untreated. 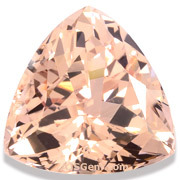 A dazzling morganite trillion in a lovely peach color. Very clean (graded "loupe clean"), this bright gem has wonderful fire. Guaranteed natural and untreated. 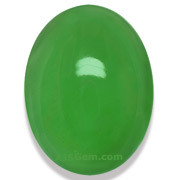 Williamsite is a rare translucent or transparent form of antigorite serpentine, with a rich color reminiscent of imperial jade. Most specimens have minor inclusions of chromite and magnetite. It has a hardness of 3.5 to 4 on the Mohs scale. Guaranteed natural and untreated. A pure white danburite, completely clean and fashioned in a portuguese cut to mamximize brilliance. Though danburite is quite inexpensive, it is a good hard stone (7 on the Mohs scale) and makes beautiful jewelery. Oligoclase belongs to the plagioclase feldspar family of minerals, which includes sunstone and labradorite. Transparent specimens of oligoclase are rare. Sometimes this material is incorrectly described as transparent amazonite. Oligoclase has a hardness of 6-6.5 on the Mohs scale. Certified by AIGS as natural albite feldspar. Sotheby's sold an 8.41 ct Fancy Vivid Purple-Pink IF Diamond for $17.77 million at their Magnificient Jewels and Jadeite Sale last month in Hong Kong. The price set a new records for a fancy vivid pink diamond. Sotheby’s also achieved a record price per carat for sapphire at $236,404 per carat with the sale of a 17.16 carat Kashmir sapphire and diamond ring for $4.06 million. Origin identification is a recent trend in lab reports for colored stones. Leading gemology labs such as GRS, GIA, AGL and Gubelin now offer country of origin identification for certain gem types, usually ruby, sapphire, emerald, spinel, jade, alexandrite and some tourmalines. The science behind these identifications is based on the pioneering work of Dr. Edward Gubelin, whose lifetime work was the study of gemstone inclusions. It is still an evolving science, however, and depends in part on collecting a wide range of sample material from different mines. Different labs may disagree on the origin of a particular gem, and the lab reports tend to use fairly careful language in stating their opinion on origin. At one time some sellers of colored gems used terms like VS and VVS for clarity grading. But these terms come from the diamond world and the clarity standards are quite different in colored gems, which tend to have more varied inclusions. Since most consumers cannot understand the difference between VS ("very slightly included") and VVS ("very, very slightly included"), professional gem dealers have adopted functional clarity descriptions which more directly convey the quality of the gem. Thus you will see that we use clarity terms like "eye clean," and "almost loupe clean" to grade clarity of colored stones. These terms tell you what you can expect to see when you examine a gem.